After winning the prestigious Competition named ‘Youth Solutions! Technology for Skills and Employment’, 2013, organized by The World Bank, Microsoft Sri Lanka and Sarvodaya-Fusion., Young Power in Social Action (YPSA) is implementing the proposed project through launching the “Empowering Youth with Disabilities through market driven ICT skills” . 20 participants were selected for the first batch among which 8 of them are female and 12 are male including persons with visual disability, physically challenged, speech and hearing disability. Md. 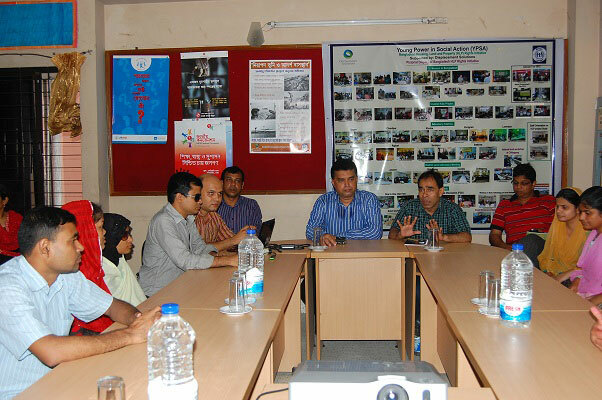 Arifur Rahman, Chief Executive of YPSA presided the launching program in association with Mr. Md. Mahbubur Rahman, Director of Social Development; Mr. Palash Chowdhury, Director of Finance and Mr..Gazi Md Mainuddin, the Human Resource Officer. Mr. Ahsan Ullah Sarkar & Miss. Shaheda Khanam was also present there on behalf of IRCD of YPSA. 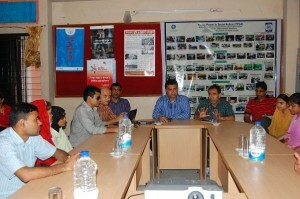 The program was synchronized by Mr. Vashkar Bhattacharjee, the Coordinator of this training program. He described the nature and extent of the training. The participants will be trained on ICT computer, literacy and producing Digital Accessible Information System (DAISY) products. After successful completion the trainees will receive internships on ICT and relevant job search support. Mr. Md. Gazi Mainuddin, the Human Resource Officer assured that the eligible candidates will be considered for YPSA as well as other organizations through advocacy. Mr. Md. Mahbubur Rahman & Mr. Palash Chowdhury also gave stress on this issue. Finally the Chief Executive concluded the launching program wishing the very success of this training so that YPSA could fulfill the promise it made to the Youth with Disabilities. In association with Mr. Vashkar Bhattacharjee the launching program was lucratively carried out by the group of few lively youth naming Mr. Subir Das, focal person, Youth in YPSA, Mr. Md. Tawhid Murad on Photography, Mr. Abdullah Al Shakir, the Web master of YPSA and Miss. Sarmistha Acharjee on documentation. The training program started from the 1st September. It can only be said that a new journey for the Youth with disability is on the motion. We wish the very success of our intent.